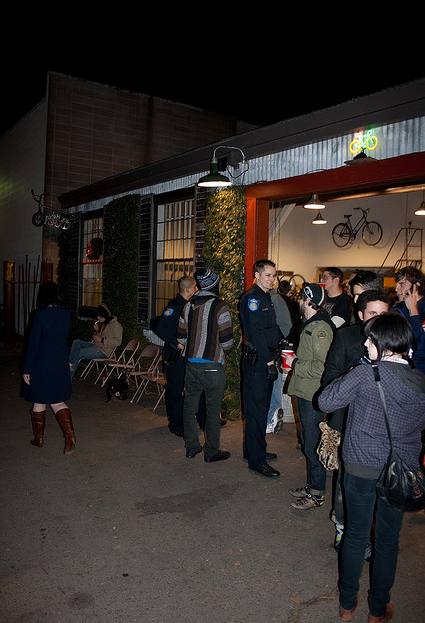 Another cop-trick: cops love art gallery openings. I think that's what's really going on here. Cops love it when you remind them that you pay their salaries with your tax dollars. Also be sure and inform them emphatically that you know your rights. And put your hand on their shoulder so they know you're being sincere. It also helps if you're white. And the only people in sight are white. And you're all dressed like white people, and nobody is playing hip hop. I wonder how they could make their bike shop be more "bike themed". That's a stripper slowing working the lads just prior to getting into the meat of the act.